In town for Lime's Staten Island bike-share debut, Scott Kubly also touts the grown-up skateboards as the future of mobility. All this e-stuff might replace car trips in the suburbs, but you’d have to own your own, because the density is too low for shared bikes to be available. In cities, what we are really talking about is less walking and fewer bus trips (growing in tandem with bike trips). Which really convinces me that buses are going to disappear other than BRT, or run empty. The only way this e-stuff replaces car trips is if Lime and the rest offer them for sale — to city residents who use them in the city, and then keep using them after moving to the suburbs. They ought to be thinking about e-bike, bike and scooter parking at commuter rail stations and commuter bus park and ride. Kubly, who has nearly a decade of bike-share experience in Chicago, Washington DC, and Seattle makes a good case here, and I agree that bike lanes should be shared with other users of lightweight personal mobility transporters traveling at comparable speeds, including motorized wheelchairs. SPEED is the issue that will make or break such shared uses. So I’m happy that Lime, Bird, and other e-scooter companies are limiting top speeds to 15 MPH. All e-bikes should also limited to that speed. Most travel in bike lanes is between 9 and 14 MPH by my observation and data I collect on my own trips. As with any mode of transit, crash risk and severity increases with speed. It’s a huge issue with throttle bikes that can be observed at 25MPH — a speed that is often more than double that of other users, that creates needless conflicts, and can be terrifying to walkers at intersections. I’m all for sharing with e-users, but let’s be smart and respectful with what we promote. Vehicle speed is the overarching safety and livable streets issue for all road users, especially walkers. One of the big inefficiency of larger motor vehicles, other than the space they occupy, is how much they weight relative to their contents. Just one percent of the energy expended by an automobile is used to move the passenger(s), with the rest lost to engine or drivetrain inefficiency or used to move the vehicle itself. Amusingly enough, this is one place where Florida is a leader. Golf cart lanes (NEVs officially). Wider than a bike lane, designed for shared use by golf carts, bikes, and I guess now scooters. The Villages in Florida — a senior development that is one of the fastest growing MSA’s in the country. And you can go just about anywhere in on bike or golf cart on separate pathways. A lot of these are definitely already for private sale – I see a handful of e-scooters on the Greenway almost every day on my way to and from work. Increased infrastructure in cities means more bike lanes, smaller roads, and less parking. Ultimately cars aren’t that useful in downtowns (particularly relative to these kinds of micromobility devices_ but take up way too much real estate. Prying that away to other uses is overall good for density and everyone. I don’t think their limiting the speed of e-scooters to 15 mph is due to any of the concerns you mention. It just has to due with the fact vehicles with such small wheels and relatively poor stability aren’t safe to use at speeds much above 15 mph. It’s liability concerns for the end user, both on the part of scooter rental companies and scooter manufacturers. In the end safety isn’t just about speed. E-bikes are perfectly safe and stable to use at 25 mph. That’s also a speed stronger riders on regular bikes already reach. If bike infrastructure can’t accommodate both slow and fast users then it’s substandard. It’s normal in the Netherlands for velomobiles going 60 kph to use the same infrastructure as school children going 20 kph. In the case you mentioned, there aren’t even that extreme speed differentials between users on regular pedal bikes and the fastest e-bikes. It’s an ~10 mph speed difference. If we want to make bike travel more useful to more people, we need to increase average speeds. Indeed, some e-bike users already mention that their commute otherwise wouldn’t be feasible without the extra speed an e-bike offers. So rather than thinking we should slow e-bikes to the speed of the average pedal bike user, I think we should use them to normalize speeds in bike lanes to 20 to 25 mph. Stronger riders will be able to reach these speeds on their own. Those who can’t (or just can’t work up a sweat for whatever reason) would opt for e-bikes to let them keep up. This approach also minimizes the speed differentials you’re concerned about. I agree it’s not ONLY about speed, but speed is a factor. A fast-approaching bicyclist—e-powered or not— is more likely to be frightening to a walker than a slow one. 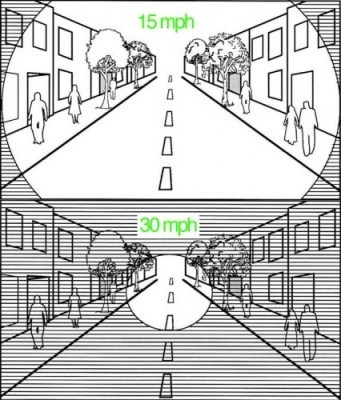 Speed also narrows a rider’s field of view — their visual field, so you’re more likely to miss objects outside that field (I have a citation for this I will dig up). I agree mass is a much bigger factor in a crash. My hope is that we can avoid/prevent crashes altogether, living (for now) in the flawed infrastructure we have. And I don’t think most Dutch cyclists ride faster than New Yorkers, esp in cities , although I will do some measurements during an upcoming trip. Although e-bikes are rapidly gaining in the Netherlands, internal-hubbed, heavy, comfortable utilitarians still dominate — more like a CitiBike than a fixe. Note that your field of vision doesn’t start narrowing until about 40 mph. This is way above the speeds we’re both talking about. Interestingly, HPS streetlights also kill peripheral vision as they emit a spectrum which the rods aren’t particularly sensitive to. This is why I’m glad NYC has replaced HPS with LED which offer much better seeing. As for frightening pedestrians, I’m not concerned about that because it’s not something which can be objectively measured. One person might be scared out of their wits by a bike passing 10 feet away at 10 mph. Another might be OK with a bike going 25 mph passing 6 inches from them. Looking at videos of the Netherlands where pedestrians seem unfazed when bikes pass them with inches to spare, I think it’s more a matter of people in this country getting used to bike traffic than with reducing speeds. On the crashes, the key here isn’t what number your speed is but rather if your speed is appropriate for the conditions. As an example, I’ve descended hills occasionally at 40 to 55 mph. I once hit 65 mph on a long descent with a tailwind. Would have have gone those kinds of speeds on a street with heavy pedestrian traffic? Absolutely not. However, given the context the speed wasn’t dangerously fast. My normal riding speeds on level ground tend to fall into the 17 to 25 mph band but I will go slower if the situation calls for it. So what’s the sense of limiting e-bike speeds to what might be called for in a worst case scenario when the rider is capable of controlling their speed? By doing that you basically deprive the end user of the ability to go faster when it’s appropriate, making e-bikes less useful as a transportation appliance. Sure, some people will go at inappropriate speeds, but remember a cyclist, unlike a motorist, has skin in the came. Hitting a pedestrian can hurt a cyclist worse than the person who was hit. So cyclists have a vest self-interest to not hit pedestrians. And by my observations they do very well at avoiding collisions. In a nutshell, we both know motor vehicles are the bigger problem by far. So let’s not do anything to make bikes, e-bikes, or e-scooters less useful as the end result of that will be more people driving motor vehicles. As for the e-scooters, I personally have no issues with the 15 mph cap but as I said my view is purely from a physics standpoint. Scooters really aren’t safe to operate much above 15 mph. There is also obviously a speed above which e-bikes lack the stability, braking, and so forth to safely operate. That in turn depends upon their construction but I’d say a lower limit on that speed is probably around 30 mph. Yes, there might be some instances where 30 mph is too fast in a bike lane given our lousy infrastructure. The answer in that case is to ride in a traffic lane. And that’s exactly why you would need more than 15 mph. This gives the rider a choice. Slow down a bit and ride in the bike lane if you feel safer there. Or brave traffic and run at top speed. Hopefully we’ll eventually have good enough bicycle infrastructure so that choice isn’t necessary. All of these scooters are available for $400 or below on Amazon or as seen in local Costco’s. What these companies aren’t mentioning is how the product was not built for multi riders and how the battery dies after 300 charges. Nobody should be call them earth friendly. I would have wished the journalist had asked about how long the e-battery lasts, I’ve seen reports of 300 charges. Then where does it go? Landfill? Note that the headline and text refers to 20MPH vs 30, but the illustration is 15 vs 30. Science on crash risk and consequences is hard, as there are many factors In addition to the overwhelming factor of mass in an actual crash. Most motor vehicles have blind spots, those on bikes, scooters, motorcycles generally don’t. There is the eyesight factor. There is reaction time that may be related to skill/training, physical fitness, and age. Road/street conditions and obstacles. And yes, speed, not just the tunnel vision effect, but obviously if one is traveling faster you are covering more ground between the time you spot something and take action than if you are moving slower. We could debate this endlessly, but just as many of us advocated that “20 is Plenty” as a sensible speed limit for most NYC streets, as a daily user of bike lanes it seems to me that bikes traveling 25 – 30 MPH are generally out-of-context for the basic design of most on-street bike lanes we have in NYC today. 1) The “20 is Plenty” campaign which some here have advocated is mainly for residential neighborhood streets. NYC decided upon a 25 mph general speed limit, which is a reasonable compromise between 20 mph and previous speed limits of 30 mph or more. Also, a 25 mph posted limit is really a defacto limit of 35 mph given the way both police and motorists in this country treat speed limits. 2) As you said, bicycles, scooters, etc. don’t have blind spots. That means they can more easily avoid crashes. Hence there’s no need to slow them down in most situations, especially given that their top speed is already less than the defacto, and in many cases legal, speed limits. 3) Crash damage is proportional to momentum change. The data which supports the “20 is Plenty” campaign shows pedestrians generally escape serious injury if their momentum change in a crash is 20 mph or less. Now let’s look at the physics. A motor vehicle for all intents and purposes is an infinite mass to a pedestrian. The pedestrian will suffer a momentum change more or less equal to the vehicle’s speed in a crash. As such, a 20 mph speed for motor vehicles will result in few serious injuries. Lighter vehicles impart less momentum change. If their mass is equal to the mass of the pedestrian they hit, then each will suffer the same momentum change. In practice these vehicles are slightly heavier, so it might be more like 60-40 or 70-30 in favor of the vehicle. Worst case then an e-bike at a speed of ~30 mph will impart the same momentum change to a pedestrian as a car/truck hitting them at 20 mph. 5) Nobody advocating a 20 mph speed limit has ever suggested that we should govern cars/trucks to 20 mph all the time. So why should we govern e-bikes to a speed which is well under what is a safe speed for their design? There are good reasons for governing e-scooters to 15 mph due to their inherent inability to accommodate large road imperfections due to their small wheels but no reasons whatsoever for limiting e-bikes to the same speed. While it’s true some of NYC’s bicycle infrastructure may not be safe over 15 mph, that doesn’t imply we should govern e-bikes to that speed ALL THE TIME. Again, it’s a double standard. 6) NYC is a large, diverse place. While bikes traveling 25 or 30 mph may be out of context in the very dense parts, there are many parts where such speeds are appropriate. Remember if we cripple e-bike speeds they suddenly become far less useful in exactly the situations where I feel they have the most utility. This is relatively rapid travel in the less dense parts of the city with poor bus/subway coverage. The alternative to e-bikes in these places is often motor vehicles. So there is a net increase in safety getting people out of automobiles and onto e-bikes, even if those e-bikes go 25 or 30 mph. If they come to New York City, we're going to need more bike lanes! And just when the city launched its e-scooter program! Data from Charlotte shows that scooters are more popular than bike share.